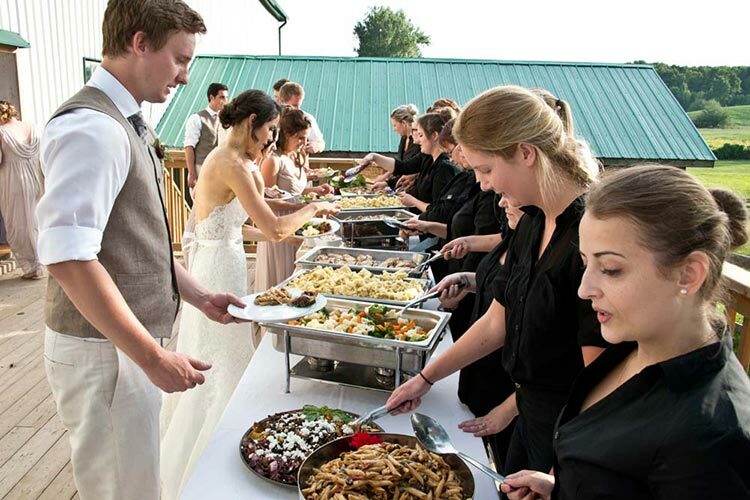 Lavender Blue Catering and Prepared Foods was founded by 2 friends with ambitions to change the expectations around food and what full service catering should feel like. They started in a small kitchen in the back half of a unit in Downtown Orangeville and in 4 years have taken the company to their permanent home at the Athlete Institute on Hwy 9 east. They operate a commercial kitchen and a retail-cafe l where you can find freshly prepared meals to take home or stay in and enjoy, or select from an extensive menu of frozen take-home meals, soups and desserts. Our freezers are stocked with entrees, soups, chili, quiches and desserts – the same quality as our catered service. Terry and Vanessa have collaborated to create a delicious assortment of seasonal hors d’oeuvres, ready for your home entertaining. These boxes are always a sell-out. All of Lavender Blue’s food is prepared in house. This means that every salad dressing, crouton, main course or dessert is created and baked especially for your day. This should be your expectation and we will go above and beyond to surpass these expectations. It means that we can provide much more then just the delicious meal at your special event. We would feel honoured to review the details of your special day and provide staffing and bartenders, dish rentals, tents and marquees, florals and décor. From 10 person meetings to 200 person Christmas parties and all that is in between, Lavender Blue is happy to provide catering services wherever you may be.